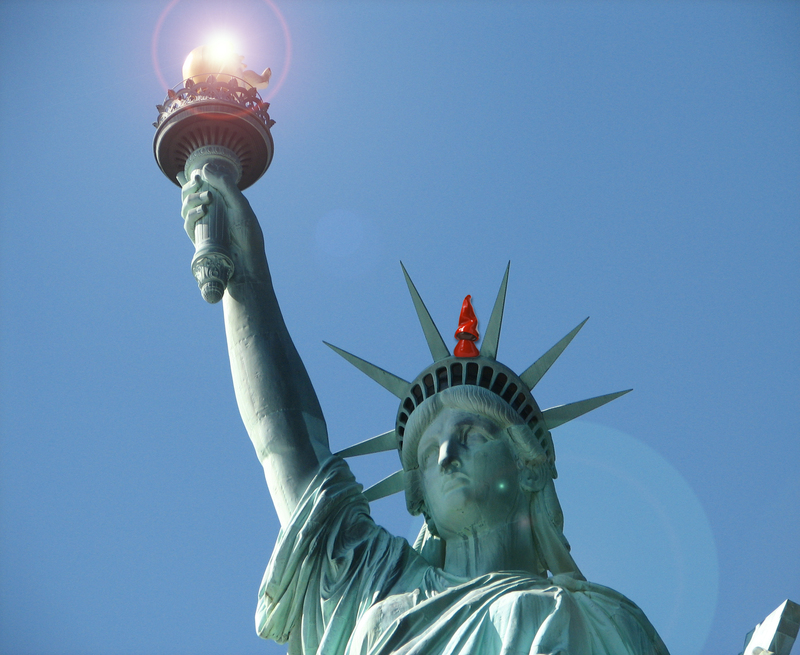 From her beacon hand glows world-wide welcome. Taken from a sonnet, The New Colossus, written in 1883 by the New York poet Emma Lazarus, it remains as poignant now, in 2011, as it did then, some 128 years ago. This celebrated script was created to be auctioned, the funds raised aiding the construction of the Statue of Liberty, a project that at times in the late 19th Century, found itself at risk from financial shortcomings. Thankfully, as we’re all aware, the funding was secured, the monument built and the rest is, as the saying goes, history. History that was celebrated in style last week at Liberty’s lavish 125th birthday commemoration. It was fitting that Emma Lazarus’ work played a pivotal part in proceedings, Sigourney Weaver reading from The New Colossus, the sonnet that, since 1903, has been displayed inside the Statue of Liberty, engraved on a brass plaque, prominent, for all to see. Liberty’s symbolism, like Emma’s sonnet, speaks loud and clear to us here in our studio. Because boil it down and Frederic Bartholdi’s celebrated statue has come to stand for all the same things that our OMs represent. To quote Grover Cleveland, the President of the time, who, on October 28, 1886, dedicated the statue, ‘a stream of light shall pierce the darkness of man’s ignorance and man’s oppression, until liberty enlightens the world’. President Cleveland’s grandson, George, was in Manhattan for last week’s celebrations. “We’re still a work in progress,” he said. So we are, but with such symbols, the work is made that bit easier for there is at least something to guide us. The Statue that dominates New York’s spectacular harbor was, of course, a gift from France to the United States to celebrate the special connection between the two nations. Since then, it has come to represent more. Much more. The Mother of Exiles, as Lazarus put it, beckoning generations of immigrants to our shores. The millions who poured through Ellis Island to seek a fresh start in the United States gazed in awe at Liberty as their ships steamed into NYC and the promised land. Last week, as the celebrations got underway, 125 recent immigrants from 46 different countries became the latest to take the citizenship oath. Never before, nowhere else, has our phrase, a global community, felt more apt. Universal was a word used on countless occasions. Here in Saunderstown, we’d like to pay our respects to Liberty, but also to Emma Lazarus, who did so much to shape the things that Bartholdi’s iconic monument has come to represent. Emma Lazarus, whose words altered Liberty’s purpose and helped reshape a nation’s outlook and attitude. Emma Lazarus, described as the Voice of Liberty, the Voice of Conscience. We’d never compare ourselves to Emma Lazarus, nor our OMs to the Statue of Liberty, but it’s clear that we’re reading from the same page here and we feel the most profound connection. It’s an incredible legacy, one that inspires us, one that will motivate us in our own efforts, our own quest of acceptance. Here’s to Liberty, and here’s to our OMs, our own symbol of hope. Here’s to lifting a lamp, to world-wide welcome.